Lessons are designed to cater for motivated students of all ages and backgrounds, from Beginner to professional levels. Lessons are ongoing in piano, voice, violin, viola, recorder, trumpet, organ, flute, double bass, euphonium, cello, theory, clarinet, guitar, trombone and saxophone. These lessons are one on one and commence on payment. for the 3-5s is on where the little ones are introduced to aspects of music through Rhythm games, singing and simple instrumentation. To speak music in a way that a child identifies with. To give them the experience of musical concepts in a natural, child oriented and fun way. To learn musical concepts by DOING! We have Holiday Programmes for the little ones between 5 & 14 years who are kept busy during the Holidays: Term 1, 2 and the long term 3 holiday for those on the National Curriculum and we have a Summercamp for those on International Curriculum. This programme is whole day for both the Beginners and Advanced where the beginners are introduced to music through various aspects like Rhythm games, Singing, Instrumentation and Dance running for 2 weeks of the holiday, except for the long holiday of Dec-Jan. This Festive seasons, we are delighted to offer you some special Discounts to usher in the Holidays. 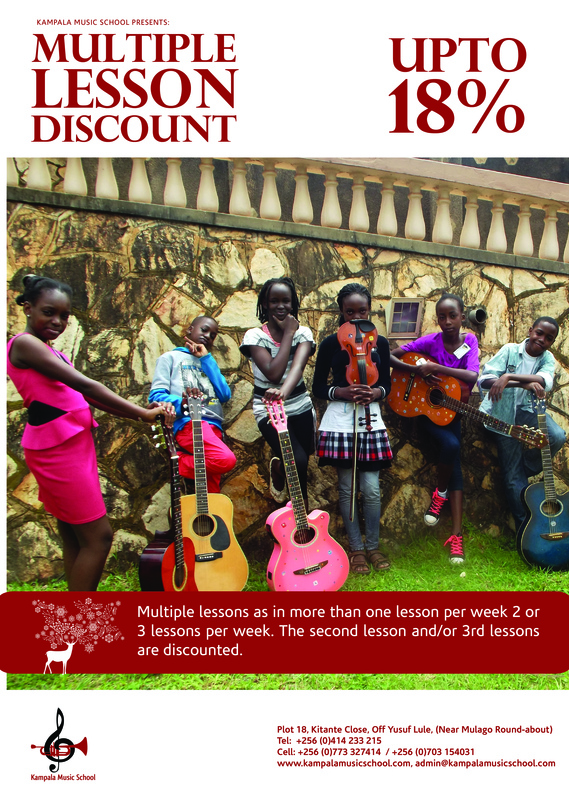 The programmes remain the same, but with a great price offer for all to enjoy and to double the progress at the same time..
Get a special package for 2 or more lessons per week in the holiday, and get upto 18% off on 12 or more these lessons. The usual lesson are available but with also a great deal on regular practice to make it more and more worthwhile to pack in the learning during the holiday. This will also allow you to make quick progress in the time. There is an additional practice package for those taking on this offer for daily practice at KMS. 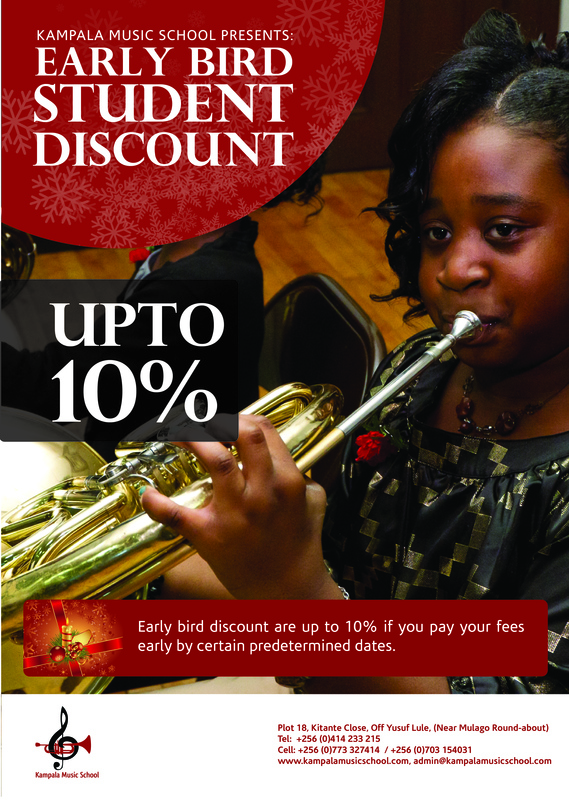 offers you a chance to get even more done for each visit to the music school. Always wanted to take on a second instrument? 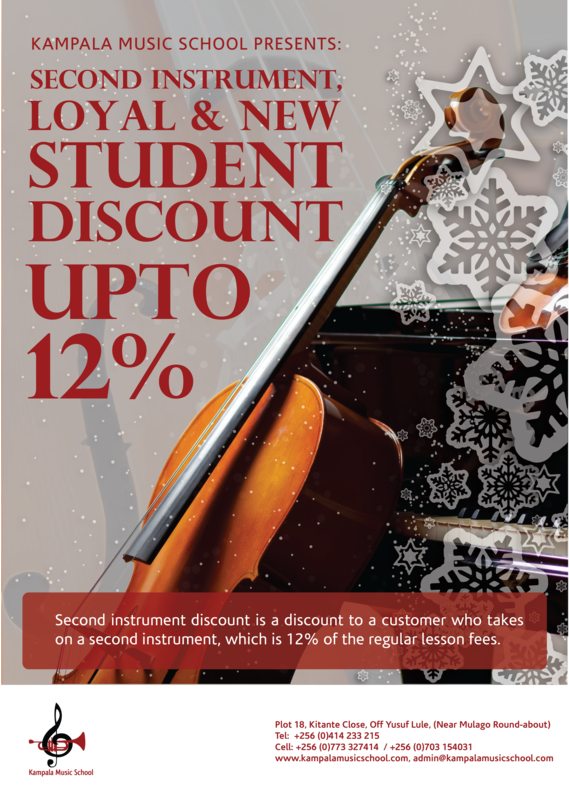 This Festive season we are offering a great price for an additional instrument to your first to be paid for per term of lessons bought. This means that for 2 instruments of 30mins you pay 480,000 (instead of 580,000), for 45 minutes you pay 630,000 (instead of 760,000) and for 60mins you pay 800,000(instead of 960,000). Other combinations are also possible. The longer you study both instruments the better you become at them and the better the discounts become over time. Fulfill your dream of having the ability to play in a band, ensemble, and even orchestra in due time. The early bird catches the worm they say. Pay for next term or future terms early, and get a discount for being an early bird. Get up to 10% off if you pay for 2 or 3 terms in advance. Enjoy your lesson and progress with these packages. These are applicable to the first instrument in the cases of multiple instruments. Make payments before the 15th of December to enjoy these packages ahead of the new year, and save on booking time and get your lessons sorted out early.